This is the Call for Papers for the 19th Global Gypsum Conference and Exhibition in Kuala Lumpur, on 23-24 October 2019. The event will look at advances in manufacturing technology, market developments, networking and business, and is expected to attract delegates from around the world. Prospective authors should email a proposed presentation title to the conference convenor, Dr Robert McCaffrey, as soon as possible to rob@propubs.com. Presenters at Global Gypsum Conference should carefully note the following points and deadlines. Main points: Confirmed authors should supply a 100-word biography and Powerpoint presentation to the convenor by 4 October 2019 at the latest! Speakers MUST attend the speaker preparation suite between 16.00-20.00 on Tuesday 22 October, to ensure that their presentations are installed and working on the conference lap top. After 20.00 on Tuesday 22 October, it may not be possible to change presentations on the conference lap top. Don't leave it until you are just about to give your presentation to change the powerpoint - this is invariably a recipe for disaster! Confirmed authors are included in the conference programme on the web site. Presenters are strongly encouraged to include new information in their presentations. Authors should use metric units throughout their presentations. Preferred units of wallboard production are Mm2/yr (millions of square metres per year). Advertising and commercial messages are strictly forbidden. Presenters may introduce their companies with a single slide. Give the delegates useful information - not advertising! All presenters must use a standard introductory 'slide', which will include the conference logo, the title of the presenter and the title of the presentation. This slide must also be used at the end of all presentations, while the question session is underway. Other 'slides' may take whatever form the presenters wish, but should include the conference logo in any of the four corners. Download Powerpoint introduction and end slide. Download conference logo: (click & hold on the image below, then save the image - the image will need to be resized on your presentation slide). The conference questionnaire will include a section allowing delegates to vote for their favourite presentations at Global Gypsum Conference. A small prize will be awarded to the presenter of the 'best' presentation, at the informal reception at the end of the conference. 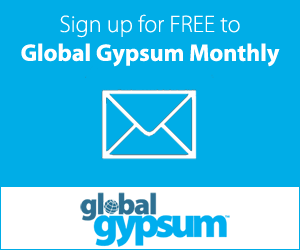 Presenters are requested to supply an optional written prose version (article) of their oral presentation, for inclusion in a future issue of Global Gypsum Magazine. The written prose version should not exceed 3000 words in length. The written prose version may be accompanied by tables, figures, diagrams and photographs. All material should be supplied by email to rob@propubs.com. The written prose version should be supplied in the form of an MSword text document, with embedded images. Any separate tables, figures, diagrams and photographs should be supplied in the form of TIF or JPG files, saved at 300dpi and 120mm width. All graphical material in the written version of the presentation must be accompanied by a full caption, and should clearly indicate its figure number/title. Presenters that do not submit material by these deadlines risk being replaced in the conference programme, from the waiting list of presenters. Thank you for your cooperation! We thank all presenters, in advance, for their hard work! • Don’t give an advertisement. The audience didn’t pay to come to the conference to listen to you trying to sell them something. They really hate this (we know, they tell us). Tell the audience something useful that they can take home. In fact, if you give them something useful and interesting, then the audience will forgive many other failings - but they won’t forgive you trying to sell them something for 25 minutes (and they won’t forget it either). Keep your company information to ONE slide. • Don’t read from a script, even if you think you need to. One of the best presentations we ever saw started as a deadly-dull script-based talk. Half way through, the presenter lost his place and did the rest from memory - it was excellent (he went on to win the best presentation prize...). • Don’t stand too close to the microphone: think of your listeners. You wouldn’t shout in their ears... and standing at at sensible distance from the mike also avoids ‘popping,’ where a pronounced ‘p’ can make an amplified booming sound. • Don’t have too many slides: We once saw a presenter try to get through 125 slides in 25 minutes (that’s 12 second per slide). 25 slides should be your absolute maximum. • Don’t try to be too clever. If you get lost in your own powerpoint, you will have lost your audience a long time ago. • Don’t talk too fast, especially if you have a strong accent. This applies to native-English speakers as well! • Never ask for questions in the middle or at the end: Questions in the midele break up the flow of your talk. Even if you have given a good talk and you ask for questions at the end, you will inevitably be confronted by an embarrassing silence. At the end, simply say “Thank you very much.” There will be applause: Then the chairman will ask for questions. Simple. • That thing about ‘tell them what you are going to tell them, tell them, and then tell them what you’ve told them’? Don’t bother. Please just spend your time telling us your interesting story - we don't need to be told it three times. Also, you might need to know the underlying structure of your talk, but we probably do not. • When you get to the conference, check to make sure that your presentation runs as you expect it to (including any movies). • Familiarise yourself with the lecturn/computer/microphone/laser pointer etc well before your alloted presentation time. On the day, don’t blame anyone else if you didn’t do your homework! • Tell a story. All good presentations have a start, a middle and an end. Often it might be ‘We had a problem, this is what we did to fix it and this is how it all turned out.’ Or it might be ‘The industry is in this situation, we’ve invented machine X, this is how it can benefit you.’ Or 'This is the way the industry was, these are the current trends and this is what the industry will look like in X years.' A good talk needs a structure. Take the audience on a journey - tell us a story. • Use pictures or video to help tell your story (but make sure that you have supplied your video in a format that can be used by the conference computers). • Think about your audience at all times: What will make them listen to you and take on board what you are telling them? • Content is king: *Think about what the audience will find most useful as a take-home as well. • Make all slides readable from the back: I’ve lost count of the number of times I’ve heard “You might not be able to read this, but...” If in doubt, leave it out. Better still, make graphs or infographics out of your tables of numbers. Tables of numbers in a presentation are a waste of space and a wasted opportunity. • Open your mouth to let the words come out. Use your voice carefully: not too high or too low, not too fast or too slow: speak carefully and be aware as well of the power of silence. • Use body language if required: connect with your audience (for example by trying to look into the eyes of every one of your listeners at least once during the presentation). Wandering about will distract your audience from your message. Never walk down the central aisle to speak from behind the front-most members of the audience - it is creepy! • Smile: the audience wants you to succeed!